Eye On Sports Media: Bobby Knight Back To Indiana? Bobby Knight Back To Indiana? Athens, GA (Feb 14, 2008) - Indiana is having to deal with the cold, hard fact that they have hired a coach who appears to not be the most honest person in the world. They knew they were hiring Kelvin Sampson when they wrote certain clauses in his contract at the time of his hire. They also know this happened because of the way Mike Davis was treated during his post-Bobby Knight tenure with the Hoosiers. And of course, Davis got the job because Bobby Knight was run out of town on a rail. So an interesting scenario could arise here. 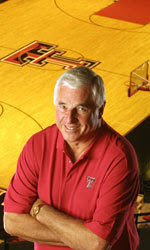 Bobby Knight recently retired/resigned from his position at Texas Tech because he felt the "time was" right, and so his son Pat could take over the Red Raiders program now. So now we have the Indiana coaching legend, who led that program for all those years without even a whiff of a scandal, available on the job market. Speculation in the media is running rampant that Sampson might not even make it through the weekend before getting fired. So who could Indiana possibly bring in to right the ship, have instant credibility with the fans and alumni, and have no scandals in his background? Why that would be Bobby Knight of course. Maybe, just maybe, he knew something was going to be happening. Maybe, just maybe, that is why he felt the "time was right". How big a story would that turn into? And since Myles Brand is long gone from Indiana, would this be so far-fetched a scenario?